HANOVER, Va. – On Thursday, March 24, 2016 at 10:06 p.m., Hanover Sheriff’s Office received a phone call from a concerned parent in regards to a possible threat made at Oak Knoll Middle School. It was reported that a student was looking at a picture of a gun and made a threatening statement to another student. 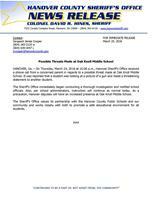 The Sheriff’s Office immediately began conducting a thorough investigation and notified school officials. Also, per school administrators, instruction will continue as normal today. As a precaution, Hanover deputies will have an increased presence at Oak Knoll Middle School. The Sheriff’s Office values its partnership with the Hanover County Public Schools and our community and works closely with both to promote a safe educational environment for all students.